When using GoldMine 8 CRM software, finding a record may be the most frequent task you perform. You can locate any record — no matter how many are in your GoldMine database — by using a simple search or a more detailed search. With just a little practice, you’ll save time and build customer relations as you put GoldMine to work. For example, you’ll need to look up records for scheduling activities, writing notes, or checking a client’s history. And every time the phone rings, you may want to quickly check the caller’s record. If you handle many phone calls every day, some may be from people who clearly know who are, but you can’t recall who he or she is. The last thing you want the mystery vendor-client-caller to know is that you don’t remember him or her. With GoldMine, you can quickly and quietly find a client’s record while you’re saying hello and making small talk. Most of the fields on the main screen allow you to point your mouse at a label and double-click, which opens a browse window. For example, if you double-click the Last label, a browse window, like the one shown below, appears. This browse window is actually called the Search Center. To make the browse window (Search Center) appear, be sure to double-click the field label — not the text box in which you enter data. The GoldMine 8 Search Center enables you to do complex searches, such as searching on multiple fields at the same time. For example, you might want to find all the accounts in California that have fax numbers. 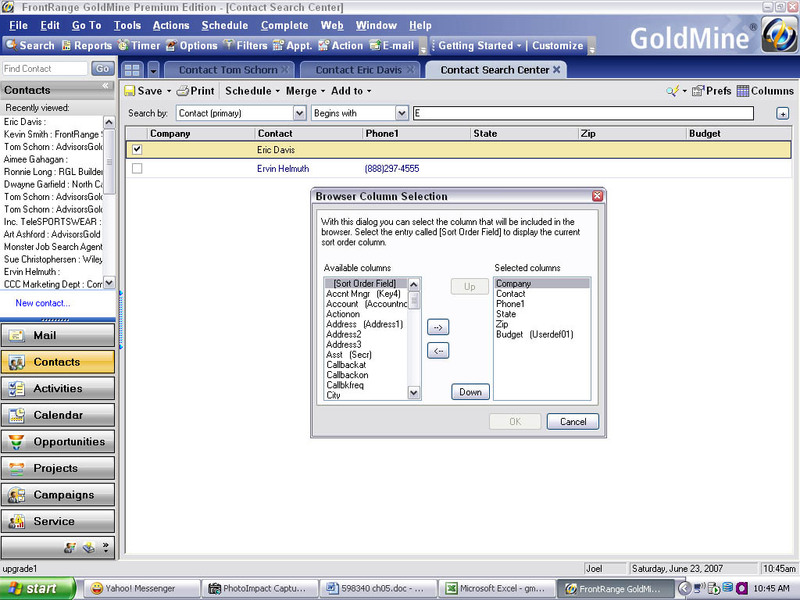 You expand your search from a simple, single-field search to multiple fields by clicking the Search button in the upper-left corner of the GoldMine screen. Fine-tune the fields you see in the Search Center. You can add or delete fields (columns) from the Search Center display by highlighting the particular field and selecting the left or right arrows in the middle of the screen to add or delete the column.